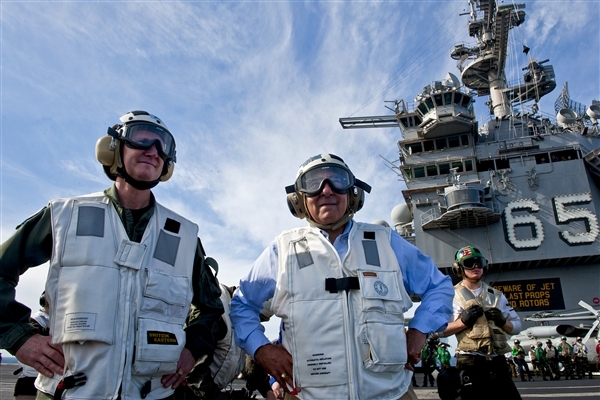 ABOARD USS ENTERPRISE, Jan. 22, 2012 — Air­craft car­ri­ers will con­tin­ue to be impor­tant to U.S. mil­i­tary strat­e­gy, Defense Sec­re­tary Leon E. Panet­ta told the crew of the USS Enter­prise yes­ter­day. Fol­low­ing his arrival on the carrier’s flight deck via heli­copter, he was greet­ed by Navy Rear Adm. Wal­ter E. Carter, com­man­der of Car­ri­er Strike Group 12, and Navy Capt. William C. Hamil­ton Jr., Enter­prise com­mand­ing offi­cer. Fol­low­ing a brief meet­ing, Panet­ta ate lunch with enlist­ed sailors on the mess decks and held an all-hands call for the more than 1,700 sailors and Marines aboard the ship. The sec­re­tary admin­is­tered the re-enlist­ment oath to 21 sailors and pre­sent­ed awards to 10 more in the ship’s hangar bay. Fol­low­ing the all-hands call, Panet­ta pre­sent­ed 200 sailors with his per­son­al coin. In the evening, Panet­ta ate din­ner in the Enter­prise ward­room with junior offi­cers before head­ing to the flag bridge to watch evening flight oper­a­tions.